This application covers several important concepts in Ionic development that will help you on your way to becoming an awesome hybrid mobile applications developer. For this tutorial, basic knowledge of HTML and CSS is expected. Some familiarity with Angular 2+, Typescript and SCSS would be beneficial but is not absolutely essential. Ionic is one of the most popular frameworks in the world for creating fast and powerful hybrid mobile applications. Companies like SworkIt, Pacifica and Diesel all use Ionic to power their mobile applications. This is because from a single code base, they can build an application for IOS, Android, Windows and other platforms. We first and foremost need to sign up on themoviedb.org site to gain authorization to use the API. On registration, log in to the site and locate the settings page by clicking on the letter icon that should have the initial of your first name. This icon will be on the right hand side of your screen and should activate a dropdown where you will find the “settings” link. While on the settings page, click on the “API” link on the left side menu and register for the API key that we will use later. Since we will be building our application in Ionic, we will need to install the Ionic CLI to generate for us our pages, providers, directives and so on. We also need cordova to bundle the application into an APK that we can be able to install on a Smartphone. We now need to create our new project so that we can get to the fun part of coding the actual application. Now enter your project directory and start the application. Congratulations, you now have an ionic application. It was pretty easy, right? Ionic is a framework built on top of Angular and thus we will be creating a service provider to handle all our HTTP requests and share the responses across the application. Our service will use the API key we registered earlier to make calls to TMDb and receive the information. Generated class for the MovieServiceProvider provider. We already have a home page but we still need to generate a few more pages to store all the data we want to display. When we use the Ionic CLI, we generate lazy loadable pages; however, our starter template still loads our application the old fashioned way and may give you trouble when building your application for production. To avoid this, we need to remove the import statements for the home page from our app.module.ts file as well as from our declarations and entry components. While we are here, let us add the HttpModule to our imports to allow us make requests to TMDb. After that, go to the app.component.html file and remove the import statements for the home page. This will create an error with the rootpage variable which we fix by placing HomePage in quotation marks. Go to the pages array and add our popular-movies and in-theatres pages as shown below. This will add them to our Side Menu. We want our home screen to have two things; a list of genres that a user can click to go to a page with movies of that particular genre and a FAB (Floating Action Button) that launches the search modal. To do this we have to call the getGenres() function from our movies-service and list out the response on our homepage. We also need to set up a function that launches the search modal and passes the genre object. In the markup, we use the Ionic Virtual scroll within our ion-list component in order to improve the apps performance and list out our genres. We add a click event to our FAB and genre title buttons to launch the search modal and movies-by-genre page respectively. Don’t forget to enable lazy loading by adding the home.module.ts file to your home folder and writing the following code to it. For our search page, we need our application to be able to call TMDb’s search API every time the user enters a letter into a search bar. We then list the response in a virtual scroll ion-list like we did in our home page and add a click event to the movie title that will launch the movie details modal and pass the object with the chosen movie’s information. Generated template for the SearchPage page. Since our search page is a modal, we add the dismiss() function and use Ionic’s View Controller to close our modal and return to the previous page. _ Generated class for the SearchPage page. _ Ionic pages and navigation. Our Movies-by-genre page requires us to call the getMoviesByGenre function from our service and pass in the id of the object we received from our homepage. In Ionic, this is made super easy by the use of NavParams. We list our response in the virtual scroll ion-list just as we have done before and add a click event to the movie title button to launch the movie details modal and pass in our object. _ Generated class for the MoviesByGenrePage page. Generated template for the MoviesByGenrePage page. This is the most important page in our application because all others lead here. We want our users to get information about the movies of their choice and this is the page where it is to be displayed. This page requires us to call the getMovie function in our service and pass in the id of the object we received from the previous page. This is a modal and so we add the dismiss function we used in our search page. _ Generated class for the MovieDetailsPage page. We use data binding to pass our values to our html file and use the ion-grid system to organize it into rows and columns. Generated template for the MovieDetailsPage page. Our popular-movies page requires us to call the getPopularMovies function from our service. This will get us a list of all the most popular movies on TMDb. We then list our response in the virtual scroll ion-list just as we did before and add a click event to the movie title button to launch the movie details modal and pass in our object. _ Generated class for the PopularMoviesPage page. Generated template for the PopularMoviesPage page. Our in-theatres page follows pretty much the same process as the popular movies except that we call the inTheatres function from our service and return the movies currently airing in cinemas. We again list our response in the same way and add a click event to the movie title button to launch the movie details modal and pass in our object. _ Generated class for the InTheatresPage page. Generated template for the InTheatresPage page. 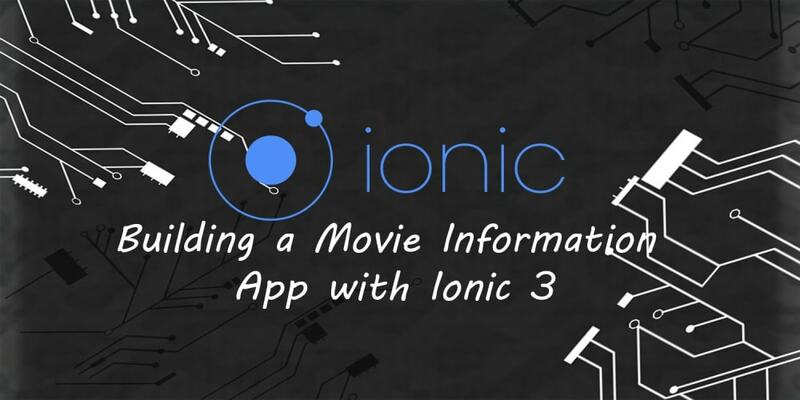 You now have an awesome Ionic 3 application and it is time to show it to the world using the Ionic CLI. First and foremost, add the platform for which we want to build the application, for example, we will use android because it is the most popular Smartphone OS. To build an android APK, you need to have the SDK on your computer and the best way to do this is to install Android Studio. Follow this instruction guide step by step to achieve this and then build your application by running the following command. To get your APK, just go to the location it specifies after the build has finished. Congratulations, you now have an ionic mobile app. Feels good, right? In Building this simple app, we have learnt several essential concepts in Ionic 3 development. We have learnt how to set up, generate pages and providers as well as serve and build an application using the Ionic CLI. We have learnt how to launch modals and navigate between pages while passing data between them. We have also touched on lazy loading which is essential in the production of high performance Ionic applications. I hope to follow this article with more detailed explanations on some of the individual concepts we have touched on. I hope you enjoyed this and are excited to experiment with developing applications in Ionic 3.